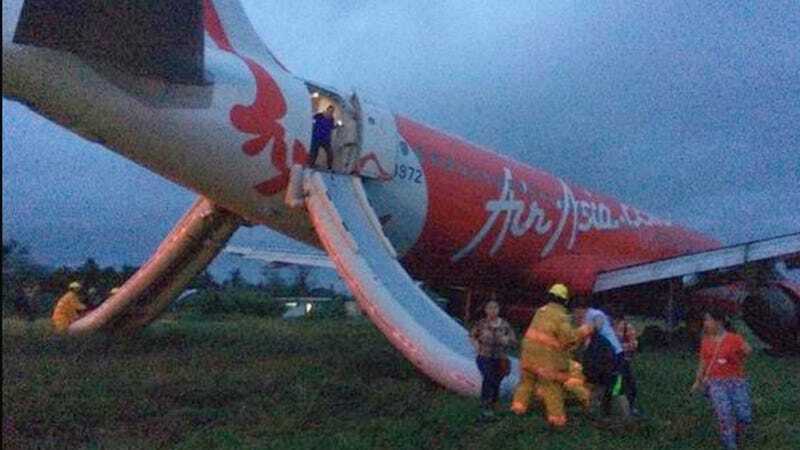 AirAsia has suffered a second incident within the span of only a couple of days, as one of its Airbus A320 planes overshot the runway at Kalibo, in the Philippines. Thankfully, this time everyone survived. This incident will hopefully be the last in an unusually traumatic year for commercial aviation. Flight Z2 (Airline code for Air Asia Zest) number 272 was arriving from Manila at dusk, carrying 159 passengers and crew. AirAsia Philippines said the incident was caused by high winds at the time of the landing, though no official weather information from the location has been given. The cloudy skies in the photos hint that the runway may have been wet from rain, but that shouldn't have been a factor.